At one time or another, I imagine we’ve all tried those exasperating claw machines stuffed full of plush bears, cats and other animals. Some of them also have toys, prizes, jewelry and more. They are eye-catching and both children and adults are equally lured to try their luck. You can find claw machines in many places – grocery stores, Wal-Mart, restaurants, arcades, movie theatres, Dave and Busters, carnivals, theme parks and more. 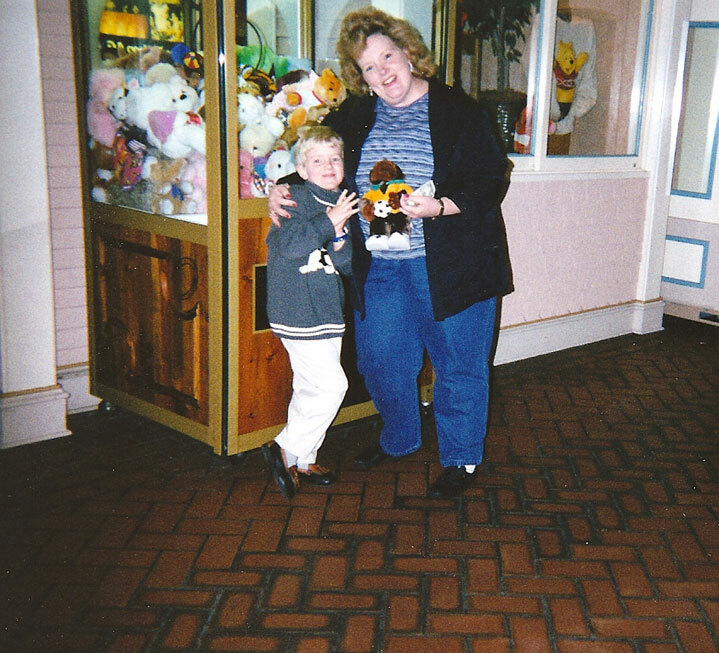 I remember Ian starting his way to becoming a claw machine champion when he was about 5 or 6 years old. There was a machine in our local grocery store, and he’d love to go to the store with my Mom (Grandma) or me and try his luck. At 5o cents a try/claw drop, we would give him about two to three dollars, and he usually never failed to walk out of the store with some cute little stuffed puppy or something else. Sometimes he would win back-to-back, and would walk out of the store with two prizes, much to the frustration of other kids standing near the machine waiting for their turn. For Ian, it was never about winning the toy/prize. It was about his skill beating the machine. Often he would turn around and give the plush animal to his sister Elyse or another little girl or boy standing nearby, broken-hearted because they had spent their last quarter and hadn’t won anything. As his skill grew on this particular machine, he sought out other claw machines in the city, and sometimes we would purposely drive to that place so Ian could try his hand. I remember going to a Wal-Mart with him (and I really don’t like to shop at Wal-Mart) specifically to try out their claw machine. After spending just eight quarters, he walked out with a tiny bear, a hot lips pillow and a dalmatian puppy with a fireman hat on its head. Quite a crowd had gathered after he won the first one (because people are skeptical of these machines and most believe they are rigged), and after we left the area, people and their kids lined up to try their hand, but I doubt if anyone was as “lucky” as Ian. However, we soon realized that it wasn’t luck, but skill. Before putting his quarters in he would study the position of various animals, noting if it was a four- or three-pronged claw. He would then put his quarters in and quickly get the claw over the top of his target. He would maneuver the claw so that the four prongs were positioned above and below both arms of the plush animal in his sights, with the central part of the claw close to the neck, or high chest area. So his trick was to grab the chest of the animal, and not the head. Often he didn’t get it on the first try, but he would use that first try to help get his target into a better position. He had a different strategy for three-pronged claw machines. In the period of one to two years, we amassed bags full of plush toys. We would eventually donate most, but Ian would keep some (for those claw conquests that had been particularly difficult). About 13-14 years ago, I was speaking at an industry trade conference in California, participating on a panel about media trends. 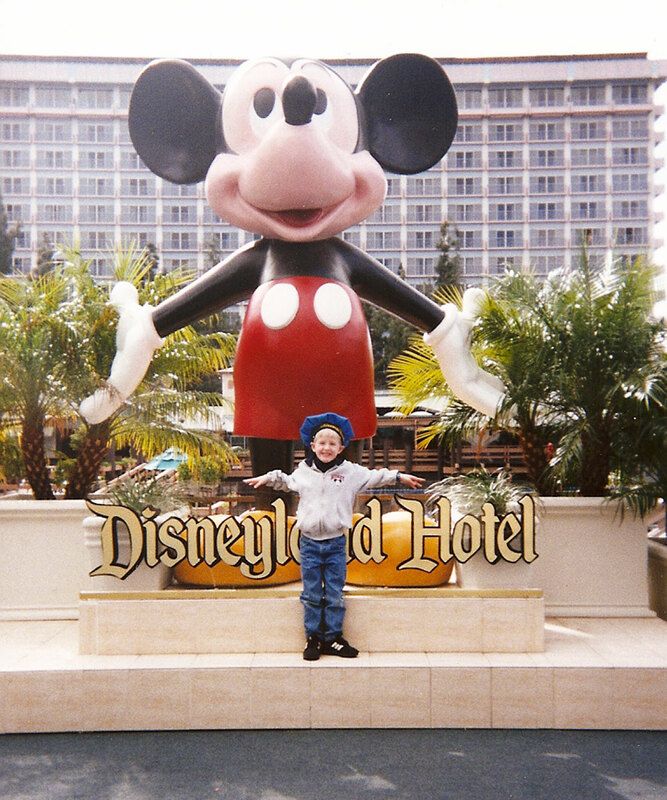 The conference was at the Disneyland Hotel, right on the Disneyland property. While this trip was noteworthy for many reasons (JFK Jr. had just launched the magazine George the year earlier, and he was the keynote speaker so I was in great company! ), it was especially memorable for Ian’s claw machine success. Because the conference was in Disneyland, ideally I had wanted to take all four nieces and nephews with me; after all, what fun is Disney without a child with you? Nick and Katie couldn’t go because of school and a few other reasons, Elyse was too little (she had just turned two), so I took Ian. Mom/Grandma came with us to watch Ian because I had to speak/go to the conference (which was on Thursday and Friday, so we planned to stay through Sunday). It was his first plane ride so he had the double excitement of going to Disneyland and riding on a plane on the same day. On his second try, he grabbed a pretty white cat with butterscotch spots on it and brown ears. It dutifully dropped down the chute, and he picked it up and gave it to me. “This is for you Aunt Sheree, for bringing me to Disneyland.” I asked him what we should call it, and he said “let’s call it Rose, because I wanted to get you a rose for bringing me here.” Oh yes, he was such a charmer, and still is! We weren’t planning on going to Disneyland until the conference was over on Saturday morning. So while I was in attendance at the various sessions, Mom and Ian hung out on the hotel property. I came back to the room the first day of the conference and they were watching TV, but sitting on my bed with Rose the cat were four more plush animals. He had won all four that day on his visit back to the claw machine. He was so excited to show me, and my Mom said he had won all four from the claw machine in less than 10 minutes. I secretly wondered if winning at the claw machine was part of the “Disney magic” – but it was in a prominent place on the property (near the Monorail station) and we saw other kids walk away empty-handed. Ian struck the machine again on Friday while I was at the conference, and came back with another four more plush toys, so he now had a total of nine! 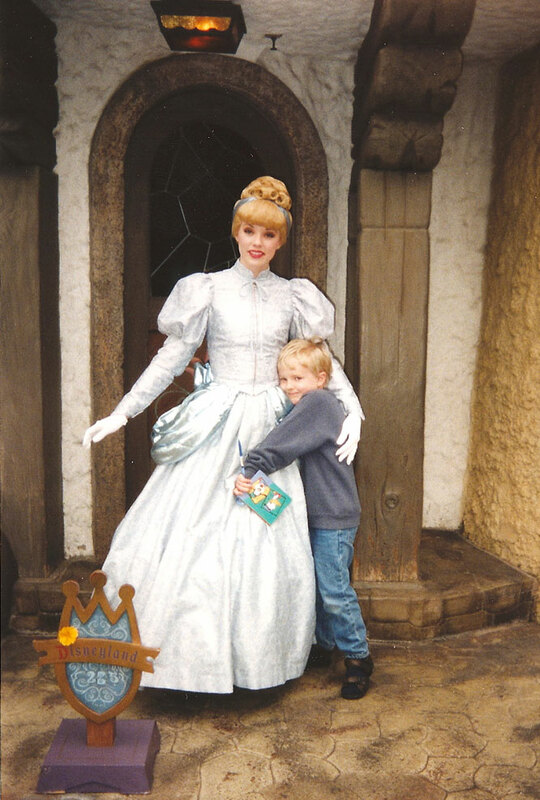 Saturday came and we were off that morning to Disneyland and we had so much fun going to Main Street, U.S.A.; walking through Cinderella’s Castle; twirling in the Tea Cups; and making our way through the Pirates of the Caribbean. We also found many characters, including Mickey Mouse and Goofy, and Ian captured all of their signatures. We spent most of the day there and at about 4PM he was getting a little tuckered so we jumped on the Monorail back to the hotel. I had learned to keep quarters in my purse for the kids – for gumball machines as well as for the claw machine. So I handed him my last 10 quarters and said, “okay this is it, try it one more time.” Well once again, he won, this time three plush animals. He was so excited and a bit proud of his claw machine skills. A little girl walked by with her Dad, and looked at the machine wistfully, but the Dad said something to his daughter that with Ian having just won three, she wouldn’t be able to win, so despite her asking to try, they kept on walking. Ian ran after them a few feet, and said, “here, you can have this bear, I already have one like it,” causing a big smile to break out on her face as she said thank you. I went into the store to buy a suitcase or backpack to put all eleven of his plush animals won from the claw machine. They wouldn’t fit in the suitcases we had, plus there were other Disney items we had purchased at Disneyland. When we got back to Kansas City and dropped Ian off at home, he was as excited to show all of his claw machine animals to his Mom and Dad as he was to tell them about Disneyland! 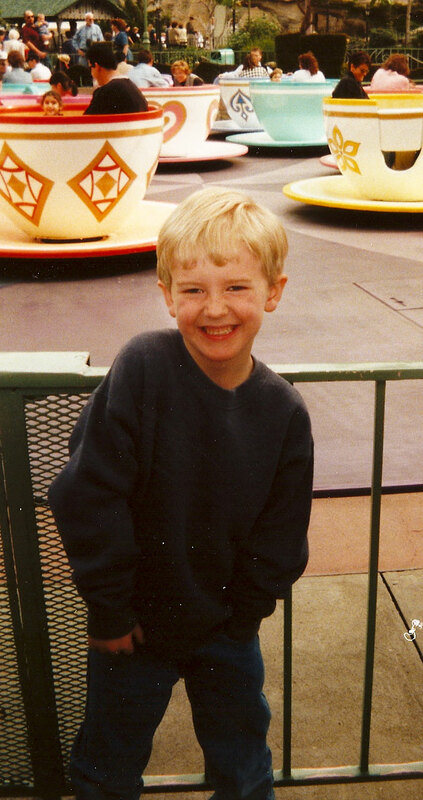 Ian continued to play claw machines as he grew older, but always gave his winning toy/animal to either Elyse or some other kid watching him play. And by this time, he ceased playing multiple times, if he won, he would be done. Just a couple of years ago while in high school, we were all going to the show together to see a holiday movie and while waiting in line to enter the theatre, he went over and played the claw machine for old times sake. On his first try, he won a mini Chiefs football, and he promptly gave it to a little boy standing there watching. The little boy said thanks, and said, “if I give you my two quarters, can you get my little brother a football as well?” Ian told him to keep his change, and said he would try. There was one more football in the glass case. Ian looked at its position, looked up at the position of the claw, walked back around to the front and dropped in two quarters. He quickly twirled the claw apparatus around so it would hit the roundest part of the football, then dropped it down at just the right minute. We were all sort of holding our breaths, and the two little brothers were watching in awe. The claw picked up the football, and barely kept it in its grasp as it made its way to the opening of the chute. It looked like he would lose it at any minute. But the football slid down the chute. Ian had beat the machine again! Everyone around cheered, and Ian picked up the football and threw a quick pass to the littler brother. We were so proud of Ian that evening, not for his claw machine skills, but for using those skills to make two little boys he didn’t even know very, very happy.